There are built-in and usual coffee machines: which one is better? It is neither type nor place of installation that make your coffee’s flavor and taste. It is about a model’s functionality, not about whether or not you put in on a table or build it in your kitchen suite. Built-in coffee makers are advanced top-class devices intended for home use. This quite so sizable element can be integrated into any kitchen interior, as it can be disguised, for example, as a cupboard. Therefore, it will not clutter your kitchen or disrupt your interior design. Operating it will not pose any difficulty either: grain and water/milk containers are pulled in and out along telescopic runners. Also, built-in kitchen coffee machines are equipped with a thermostatic device, which can maintain optimal water temperature for twenty four hours. There is a water level indicator, so you can see if there is water in the container. All functions and controls are on the front panel. Nearly all this built-in appliances feature an automatic shutoff function, so you do not need to worry about safety. These are low-maintenance appliances: most models feature a removable tray. Just pull it out and wash away waste. Latest models feature automatic self-cleaning systems, which remove lime buildup, hograin waste and oil buildup. Some appliances have settings for different types of coffee: espresso, cappuccino, latte, etc., as well as temperature adjustment systems and grain/water level indicators, so you can add grains or water if necessary. There is an opinion that coffee makers are difficult to maintain, but this is not about advanced models. In fact, the only maintenance you need to do is rinse the brewing unit once every three to six months. Manual built-in espresso machines have portafilters, which are uniformly filled with coffee grounds. The powder is exposed to steam pressure, and you get a cup of fresh and flavored hot drink. Semi-automatic built-in appliances feature electric grinders and hence the bean-to-cup function. Built-in fully automatic espresso machines require zero effort on users’ side. As the name suggests, the brewing process is fully automated. All you need to do is select the type of beverage and press a button. You get a cup of fine hot drink in a couple of minutes. A built-in pod system pours the drink in capsules made of clingfilmed plastic or aluminum. Mostly, they are manufactured for particular types of coffee makers. The device perforates a capsule filled with ground espresso beans, and boiling water is forced into it through the hole. Now the drink is ready! Built-in pod system work very fast, and you do not need to rinse it because they use throwaway capsules. First, it should be noted that these devices are very user friendly. All functions and options are displayed on the front panel. For safety reasons, almost all built-in appliances feature an automatic shut-off function. 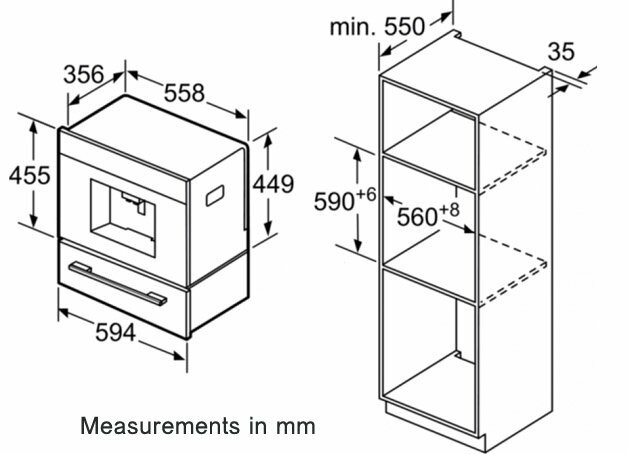 Standard dimension: height – 45 cm, width – 56 cm, length – 55 cm. Many people think that these appliances are only good for home use, but they are not. Today, built-in machines are increasingly common in offices and hotels. When choosing a model for yourself, please, study the device’s specifications and functionality. This type of coffee maker is a more suitable tool for a large kitchen. An appliance built in a small one will take up even more space than a standalone. While having functionality equivalent to that of a standalone coffee maker, it will cost you more. Most expensive types of built-in devices do not have some advanced flavor settings, while many simpler ones (standalone) do.